Websites are the strategic foundation for all of your online marketing and sales. Yet most companies only update them sporadically. Shouldn’t a website be continuously improving and evaluated, just like a marketing campaign or a sales quota? With Growth-Driven Design, you can get the advantages of a constantly improving website. Traditional web design works when you know exactly what set of features you’ll need to develop and when you have the ability to dedicate internal resources for the project. But even then, you aren’t able to take what you learn from the site and adjust it significantly until the next version of your website, which could be 18-24 months down the road. Growth-Driven Design allows you to evolve your website with a much more regular pace, so that it’s improving on a quicker basis than would normally happen. If your website serves as the basis of your marketing and sales efforts, the effect can be significant. A typical project will begin with an initial phase that’s focused on the website strategy and prioritizing what the site needs to launch versus what can be developed after launch. Ideally, the launch site should come to a happy medium of speed (getting it up quickly) and completeness (what’s important in order to launch). After the first version of the new site is launched, the Growth-Driven part begins. Instead of assuming we understand everything about how the website should be built upfront, we’ll seek to incorporate user research and feedback as more of the site is created. We do this by focusing on iterations after the initial site. By either working through a wishlist of features, or by analyzing the usage of the current site, we’ll work with you to identify the ongoing opportunities with your website, then develop and test them. After they’ve been up for enough time, we’ll come back and discuss how they’re performing, and how they can be continuously improved. During this phase, we’ll work with the client to understand their needs and goals for their website, focusing specifically on how it will be used for online marketing, lead generation, sales, customer education, and operations. Once we’ve done that, we’ll develop a list of website needs based on that feedback and begin to prioritize it. From that list, we’ll determine with the client what needs to be developed on phase one and what can be developed later once we know more about how the site is being used. Then the normal development process will begin. We’ll start with style tiles to determine the design assets, then upon approval, move into full mockups for different templates and screen sizes. Once that is approved, we’ll begin development. We’ll conclude with testing and content migration. The goal of this process is to move quickly so that we can begin receiving feedback on how the site is used. At this point, we’ll begin working through features from the wish list and updates identified by looking at the user data. Each iteration will be evaluated by how well it’s being used, whether it affected the intended metric, or whether it helps the intended party. PLAN what can be changed or added to the site to improve on a KPI. DEVELOP the needed update to accomplish the above. LEARN how the users respond to the change. TRANSFER the knowledge to client for use in future iterations. Phase Two can continue for as long as is needed. While the costs of it can change based on the client, we typically price it based on number of iterations per month. 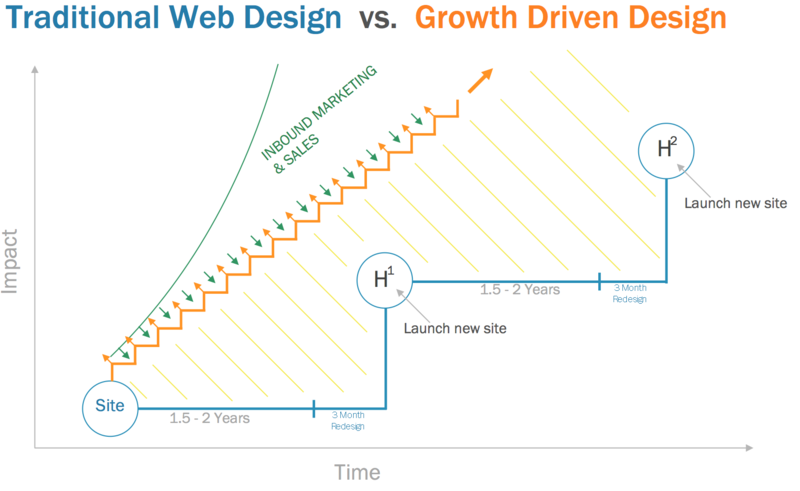 Want to know more about how Growth-Driven Design can improve your website and grow your business? Sign up for a free site analysis with one of our specialists. Companies who need their website to always be improving. A constantly improving website that learns and adjusts based on user data. 1-2 months to get started, the rest is up to you and your specific goals. After conducting a site analysis for your website, we will send you a quote.